Grammar-wise, the enhancement is fairly simple, but the scoping aspect is a little more difficult to get right. Generally speaking, implementation of the scoping is a bit of a hotch-potch of concerns: functionally it is closely tied to the actual abstract syntax of the DSL, combined with concerns on performance/scalability and maintainability/language evolution. While implementing the feature, I’ll show a number of tricks to help with the scoping aspect. Prerequisites From now on, I’ll assume that you’re working with Eclipse Helios, with Xtext 1.0 installed -preferably the Itemis bundle found here as it comes with the Antlr parser generation backend. 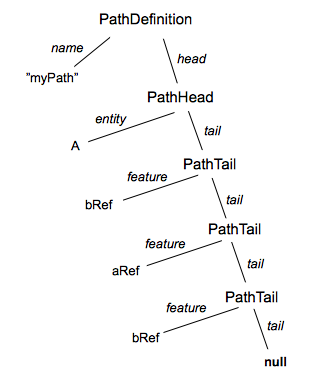 This tells the grammar that I can define paths which consist of a name and a path expression starting with a reference to an entity and continues with references to structural features of an entity (i.e., an attribute or a reference to another entity, not an operation) prefixed with a slash, in a tail recursive manner. We’ll call each of the references to a structural feature a path element. Note that the PathHead rule could very well be rolled into the PathDefinition rule but that prevents re-use of path expressions outside of a path definition, so we’ll not do that now. we’d have to come up with a way of knowing at what item in the list the scoping was triggered. Using tail recursion like this, scoping is going to be called for the PathTail element which is contained through a containing reference called tail and we have to provide a scope for the (multi-valued) feature reference based on the path which ‘comes before’. Here, tree nodes are labelled with the grammar rule name and edges are (object) references labelled with the grammar rule feature. Now, run the GenerateDomainmodelLanguage.mwe2 workflow to generate parser, editor, etc. 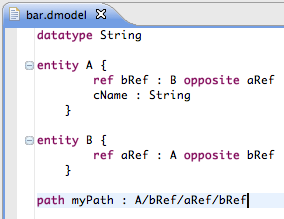 Now open the org.eclipse.xtext.example.scoping.DomainmodelScopeProvider class (e.g., using Ctrl/Cmd+Shift+T ‘Open Type’) and note that it inherits from AbstractDeclarativeScopeProvider. This means multiple/polymorphic dispatch is used to get to the correct scoping method based on the (runtime) type of the model element (EClass) and cross-reference (EReference) for which the scoping is triggered. To avoid that our scoping code breaks silently immediately after we change the grammar in a way we don’t anticipate at the moment (and as it’s an example I’m not anticipating anything), it is prudent to throw an unchecked exception with a meaningful message to alert the language engineer (that’s you!) as early as possible you need to fix something. Note that the editor does not break this way, but the exception will show up on the console of the launching Eclipse instance and the local scope will be empty -everything that shows up in the content assist is a consequence of the parser recovering. Now, we have to distinguish between two cases. The first case is that the parent of the PathTail instance (i.e., parser node) for which to compute the scope of the feature…uhm…feature is a PathHead. In this case, the scope is all the Reference or Attribute (i.e., StructuralFeature) elements in the features list attribute of the Entity referenced by the PathHead, which excludes all Operations. The second case is where the parent is another PathTail instance which (presumably) has a non-null Reference which points to an instance of Type. If that instance is an Entity, the scope is simply all structural features of that Entity. If not, the user is trying to continue a path expression from a singular Attribute which must be considered an error which we choose to express as the scope being empty so nothing valid can be filled out at that spot. // an ERROR, triggered here through the scope being empty. Note that we used a method from org.eclipse.xtext.EcoreUtil2 which happens to be a nice and useful util class inside the Xtext runtime. Now, the implementation looks rather ugly with al those explicit ifs and downcasts. Using polymorphic dispatch we’d be able to write the same thing down much more cleanly, but in our rather limited case it adds as many lines of boilerplate code as it saves ‘functional’ code, so we’ll leave that to a situation where the need for clarity and maintainability outweighs those extra lines. To make this feature a little more mature, we could add a validation warning that a path expression ending on an attribute cannot be continued further. In any case, when continuing such a path expression, the scope for the feature reference would be empty, so the continued path would always be flagged with an error. The warning would just serve as an explanation of why the error would be there, so it’s not totally clear we’d need that validation. 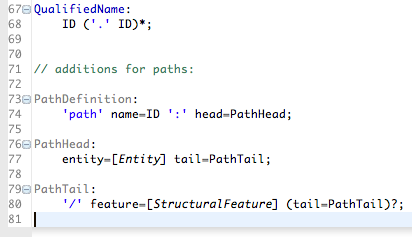 A validation which is already quite useful to add, is to warn for path expressions which encounter a path element which points to a multi-valued attribute or reference anywhere before the final element. Again, I’ll leave that as an exercise to the reader for now. P.S. : I changed some details of this blog with respect to the implementation of the scoping provider, necessitated by changes between Xtext 1.0.0 and 1.0.1 in the shipped examples. Is this still compatible for Xtext 2.0 ? This is still largely compatible with Xtext 2.x (x=1 coming up quite soon). The scopeFor method resides in org.eclipse.xtext.scoping.Scopes and I used a static import to be able to write the Java code above. However, for the specific situation that you’re extending the ‘Xtext Domain-Model Example’, you need to take into account that its implementation has changed quite a bit and that goes quite a bit further than the facts that its scope provider is written in Xtend and doesn’t inherit from AbstractDeclarativeScopeProvider. See http://wp.me/p10ERi-af for the Xtext 2.1 revision.